"There is nothing you can do, you need to talk to representatives of the Russian Federation." 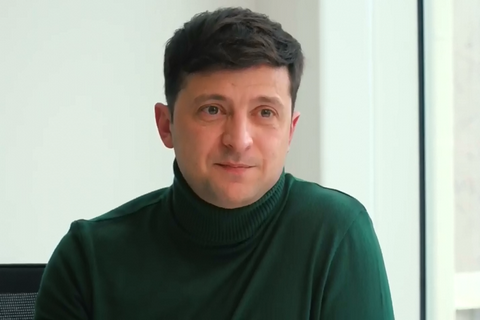 Presidential candidate and comedian Volodymyr Zelenskyy has said that in case of his election, he is ready to negotiate with Russia about peace in Donbas with the involvement of the USA and Great Britain. "We do not want a war any longer, we did not start this war. But if we have at least any chance to stop this war, we must do our best to prevent our people from dying," he said in an interview with the Western media and Kyivpost. His peace plan foresees a ceasefire as a priority. "The return of all territories is a serious issue. One should not get tagged as the president because any person would say: we all want and will fight until we recover all the territories. This is our house and we will protect it," he said. In his opinion, the Minsk agreements on a Donbas settlement are ineffective and should be expanded to include Great Britain and the USA. He described negotiations with Russia inevitable. "There is nothing you can do, you need to talk to representatives of the Russian Federation," he said. He ruled out the surrender of Crimea in exchange for peace in Donbas.